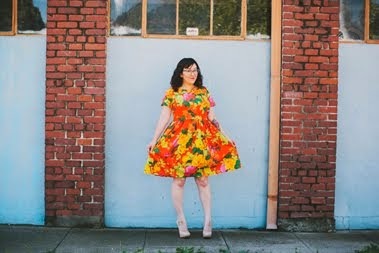 I was looking around on Flickr for Licorice dress inspiration when I came across Jenny's dress and immediately loved it! Both her muslin and final version of the dress are so eye catching. Be sure to check out her blog for more information and photos. Thanks so much for sharing with us, Jenny! Erin knocked my socks off when she contacted me & asked me to do a guest post for the final project of Sew Colette- the Licorice Dress! I’d been itching to make this one up ever since I got my copy of the book, and am not disappointed with the results… even if I do say so myself As usual, the instructions are extra-clear and easy to follow, with heaps of diagrams to boot! 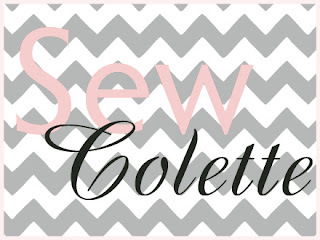 (For this reason alone I would recommend Colette Patterns to any beginner seamstress). Anyhoo, enough with the chit-chat, let’s get down to business! The blue dress/ wearable muslin is made from viscose from The Fabric Store in Melbourne and the polka dot collar is a silk/ cotton blend from Global Fabrics in Dunedin. The collar fabric was quite sheer so I decided to fuse it with a very lightweight interfacing. I wouldn’t really recommend doing this because even with a light fusing you lose the lovely drape of the collar. The second dress is made from silk crepe, also from The Fabric Store, and is lined with a viscose lining from Clegs. I’ve never sewn with 100% silk before but found the crepe pretty manageable and would really recommend it to other people who would like to give it a go. It’s not as slippery as other silk fabrics but still requires a few extras like patience when cutting, French seams and a sharp needle, all useful things for easing yourself into the nerve-racking territory of extra slippery silks! Was there a benefit to sewing a muslin first? Do you normally sew muslins? Sometimes I do & sometimes I don’t, although now that I’m tending to buy better quality fabrics, I guess I would say probably more often than not, even if it’s just for the fitted part of the garment. I was pretty confident I’d be able to make the muslin of this pattern a keeper, which is why I used better fabrics for it, but at the same time I just wanted to err on the side of caution! I suppose I would say that the main benefit of sewing a muslin for me is peace of mind. What would you do differently the next time around? I’m pretty happy with the fit, but I think I’d like to play around with the sleeves a bit more. I really love the sleeves on Tilly’s latest button-back blouse, and have a couple of patterns that I might borrow the sleeves from –Simplicity 5347 which has longer puffy sleeves with a cuff, and Simplicity 9747 which has puffy sleeves that are gathered with tucks above the elbow. Aside from that, I love how the simplicity of the pattern means that you can let the fabric do the talking (“pick me, pick me!”). I’d like to experiment with a fabric with a little less drape and cute floral print. How long did each dress take you to make? I wasn’t really keeping track, but the 1st one, probably a few nights after work, and the 2nd one, maybe a week or so. Do you have any advice for someone sewing this for their first time? Because the style of the dress is quite simple, it’s the perfect opportunity to invest extra time in the fitting. I think the 2 examples of the dress in the book really illustrate how different the dress can look depending on the fit. One alteration that I would definitely suggest is to add a curve to the straight centre back seam. Well, that’s all from me folks! Thanks to Erin & Sarah for having me, and thanks y’all for reading! Looking forward to seeing all of your creations! WOW! I love the blue and polkadot! !